Find out what Fate has in Store for You in this Year of the Horse! Enter the Chinese New Year with excitement and fashion fun! Luck has got something great for fanatics of style out there in this year of the horse. Zalora.com.ph now offers a thrilling and mysterious way to shop for the trendiest heels and wedges. Behold, our Chinese New Year Mystery Discount Sale! Find the hippest and most stylish heels and wedges, and get up to 99% off when you purchase at Zalora Philippines. Gratify your shoe cravings, while saving some cash as well! 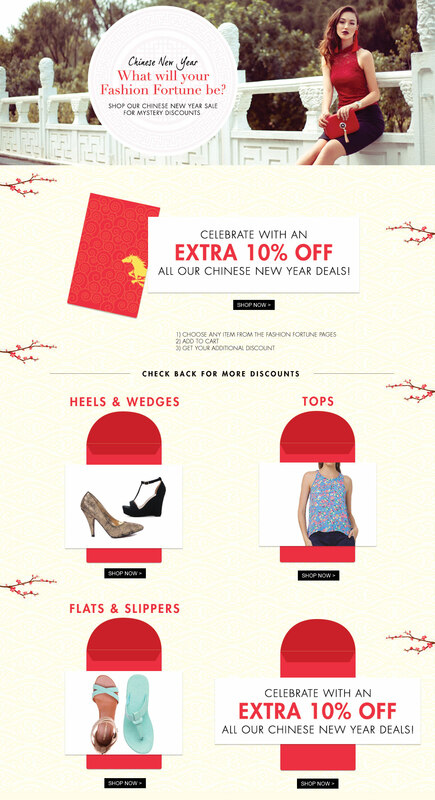 Start the Chinese New Year right, shop at Zalora!